According to the World Health Organisation, 80% of educational material is remembered when delivered via visual means, and 90% through interactive lessons, compared to just 25% retained from one-way verbal lectures. As a result, visual communication technologies – such as projectors and flat panels – are revolutionising the way education is delivered in schools and universities. But as the traditional delivery of education diminishes and digitisation in general increases, so does the negative impact on eye health. In fact, there has been a dramatic increase in myopia (short-sightedness) among half of Europe’s young adults – double the total amount 50 years ago. Yet, despite the established link between the use of screens and eye health, many schools today remain uninformed as to proper screen use and decision-making protocols. There are two technology choices when it comes to group screen-teaching in schools: flat panels and projectors. Of the two, projectors are the established technology, but flat panels are being adopted by some establishments due to familiarity and perceived simplicity. However, research shows that 58% of students cannot read all content provided on a 70-inch flat panel, and not seeing what is being taught is not only detrimental to learning, but places undue strain on the eyes. Despite this, there is still no Europe-wide legislation in place to govern how such technology should be used in the classroom, or to ensure that what is installed is visible to all students in the class and, therefore, fit for purpose. Projectors offer a far more responsible and flexible choice for the education environment, providing much bigger, scalable screen sizes of up to 100 inches. Furthermore, today’s projectors are incredibly advanced, performing in daylight with super-high colour brightness, as well as incorporating connectivity that allows for BYOD interaction, interactive sensing and touch technologies, and bigger distortion-free images. In addition, they are more portable and take up much less space when not in use than a flat panel. As market leader in projectors for the past 13 years, and working closely with a range of schools and training institutions, Epson knows how vision of projected information and images affect learning outcomes. As part of its CSR efforts, Epson is constantly pushing the boundaries to ensure its products truly meet user needs. Recognising the need for clear recommendations, Epson works with partners to ensure they have the correct product for their purposes. This ensures projected content is not too small, is of high quality and is clearly visible, taking into consideration viewing distance and angle from the screen. The result is that everyone in the room has the same opportunity to engage and share information. Today’s learning methods are no longer centred on one person presenting to a group of students. Instead, students are presenting to other students as well as using screens to work collaboratively throughout the wider group. Therefore, classrooms require a planning process to facilitate appropriate integration of technology. It is important to assess the needs and limitations of the environment parameters – room size, number of people using it, etc, and despite there being no overall legislation in place, there are currently several guiding principles that should be followed in order to maximise learning capacity and minimise the impact on students’ eyesight. – The maximum horizontal and vertical viewing angle is considered to be 45 degrees and 30 degrees respectively. regulatory bodies and states that the furthest participant in the room from the screen should sit no further than 4-6-8 times the vertical height of the screen away, depending on the task being performed. “Passive viewing” (eg video viewing), can be the furthest away, followed by “detailed viewing” (eg general reading of presentations), and lastly “inspection viewing” (eg small text and spreadsheet content) whereby the furthest participant can be no further than four times the vertical height of the screen away. As research and analyst firm The Smart Cube reports, numerous factors come into play when ascertaining the technology to opt for and the size of the screen needed including ceiling height, length and width of room, number of people in the room and budget available. Clearly, this impacts the buying choice between flat panels and projectors. And although there are no universally recognised standards for screen size, only guidelines, it cannot be disputed: the larger the screen the more likely information is to be clearly seen and therefore retained and comprehended by the classroom audience. Consequently, the education sector – in order to enable maximum learning potential and minimum health impact – should more regularly be choosing projectors over flat panel screens. 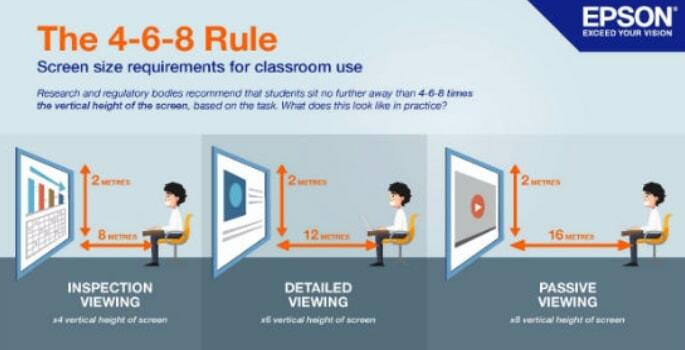 When it comes to visual communication and interactive and collaborative learning, screen size does, in fact, matter.